Preview: Hellboy: Sword of Storms | Kris Johnson's Blog…sort of. Though I don’t own any of Mike Mignola’s Hellboy graphic novels, I absolutely loved the 2004 movie starring Ron Perlman as the titular character. Perlman and several of his live-action co-stars are lending their voices to two animated Hellboy movies. The first, Sword of Storms is set to premiere on the Cartoon Network in late October 2006. The second, Blood and Iron will debut early in 2007. I’ve previously linked to the production diaries of Tad Stones, which feature all kinds of behind the scenes insight into just how much work goes into creating an animated feature. 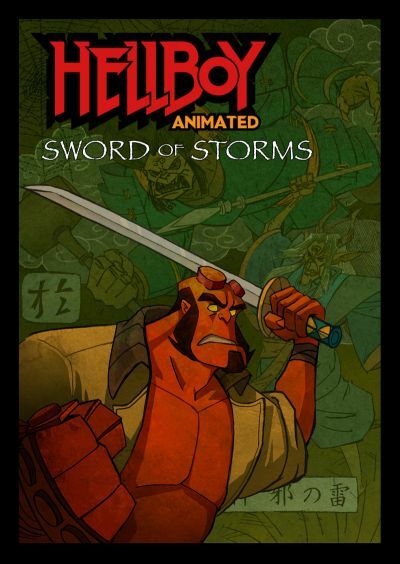 Now there’s an official site for the animated movies, GoToHellBoy.com, featuring descriptions of the movies, downloadable wallpaper, AIM buddy icons and a teaser trailer for Sword of Storms. The screenshots and animation look fantastic, and there’s just no way you can go wrong with Ron Perlman as Hellboy and John Hurt as Professor Bloom. What I find interesting is that Doug Jones will be providing the voice of Abe Sapien, the amphibious BPRD agent known as “Blue.” In the live-action movie, Doug Jones portrayed Abe on screen, but David Hyde-Pierce (Frasier‘s Dr. Niles Crane) provided his voice.Doug Jones will also provide the voice of the Silver Surfer in the sequel to Fantastic Four. Can you tell I’m looking forward to seeing these movies on Cartoon Network? Well, I am. Almost as much as I’m looking forward to their eventual release on DVD (in February and June of 2007) and the second live-action movie, Hellboy 2: The Golden Army.